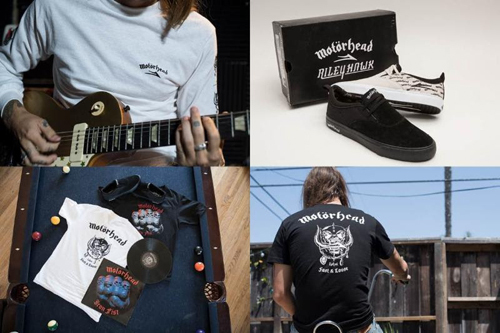 Lakai Limited Footwear is proud to reveal its latest collaboration: a co-branded footwear and apparel capsule with rock legends, MOTÖRHEAD, centered around Lakai professional Riley Hawk. The deal was brokered by Global Merchandising Services, Inc, worldwide Licensing Agent for the band. Riley Hawk, son of prominent skateboarding icon Tony Hawk, has built his own career and reputation as one of the most promising and talented young professional skateboarders of his era. Riley has filmed numerous full-length video parts, traveled the world with his sponsors, and has managed to find the time to practice, record, and travel with a band of his own. When asking Riley where he draws his musical inspiration for his skating, band, and lifestyle, MOTÖRHEAD was at the top of his list. Riley truly embodies the "Fast and Loose", pedal to the metal, skateboard/rock and roll lifestyle. Therefore, a Riley x Lakai x MOTÖRHEAD project made perfect sense. The Lakai x MOTÖRHEAD collection consists of three custom co-branded styles of Riley's new signature model shoe, The Riley Hawk 2. The collection also includes custom co-branded "Iron Fist" and "Warpigs" short sleeve tee's, a long sleeve tee, and pullover hoody.